In June 1924, thousands flocked to Cleveland as visitors and delegates to the 18th Republican National Convention. The newly-built Public Auditorium echoed with speeches and rousing patriotic tunes led by John Philip Sousa. Outside, salesmen hawked elephant figurines and women held signs emblazoned with the name of the presumed Republican nominee and current president: Calvin Coolidge. Clevelanders clustered around speakers set up in the Arcade while listeners throughout the country tuned in from the comfort of their living rooms to experience the first national party convention that was broadcast over the radio. 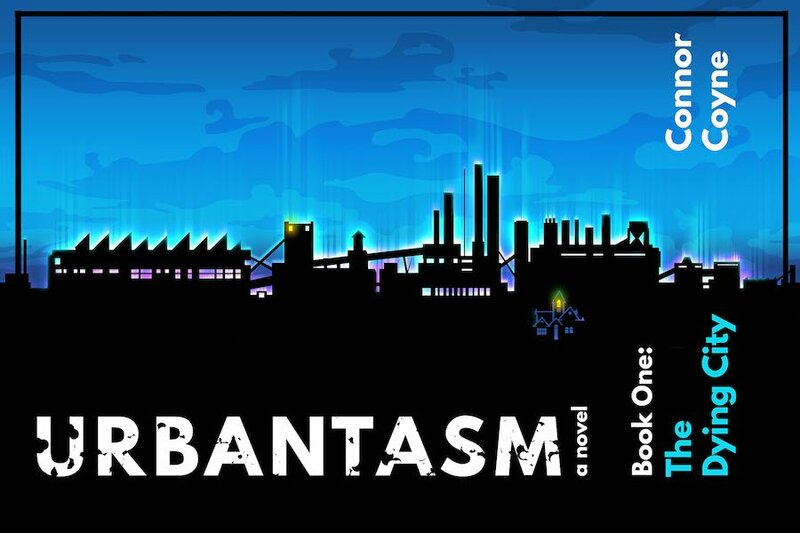 The possibilities in Cleveland were a perfect fit for the relatively young Republican Party. 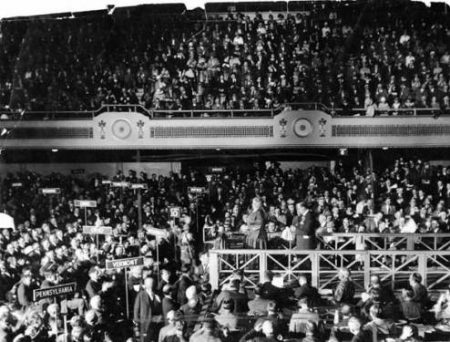 RNC speaker and delegates, Cleveland Public Auditorium, 1924. Photo credit: Special collections, Michael Schwartz Library, Cleveland State University. Supporters of women’s rights, too, hoped that the convention in Cleveland would further their cause. The campaign for women’s right to vote predated the founding of the Republican Party, but women’s representation in the national party had been scarce. But what a first national party convention to attend. The faces of delegates inside the Public Auditorium looked markedly different than those at the Republican convention in Chicago four years earlier, when only twenty-seven delegates were women. In 1924, 120 women were delegates, with 277 serving as alternates. Not only were women better represented as delegates, the national committee passed a measure that required each state and territory to be represented by one man and one woman, doubling the committee in size. While convention-goers in Cleveland celebrated this requirement as a triumph for women’s rights, it was rescinded a mere 28 years later. Yet, women delegates made the most of their time at the convention in Cleveland. They gave speeches seeking the party’s support for issues ranging from temperance to peace. Republican Convention in session, Cleveland Public Auditorium, 1924. Photo credit: Special collections, Michael Schwartz Library, Cleveland State University. 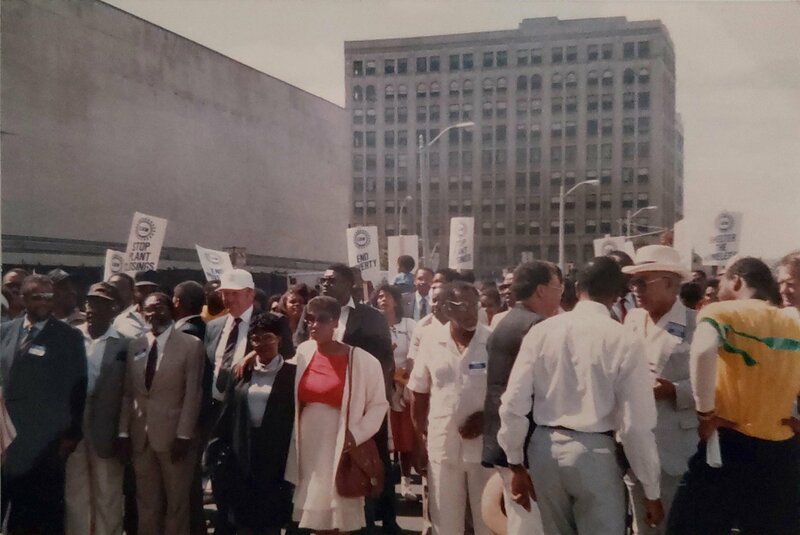 Hallie Quinn Brown, president of the National Association of Colored Women and vice president of the Ohio Council of Republican women, attended as a delegate and addressed the convention. Although she had criticized the Republican Party four years earlier for not taking a stronger stance in opposition to lynching, she helped organize African-American women to support the Republican cause through the National League of Republican Colored Women. When Florence Collins Porter, a member of the Woman’s Christian Temperance Union and a former crusader for women’s suffrage, gave a speech seconding the nomination of Calvin Coolidge, she paved the way for other women to follow in her path. The women focused on more serious matters. 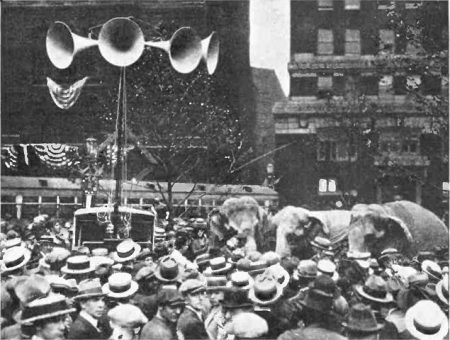 Crowd outside the 1924 Republican National Convention in Cleveland listen to speeches broadcast from inside the hall via an early “public address system.” From a 1924 issue of Popular Radio magazine. President Coolidge was the undisputed nominee. The vice-presidential nomination was less clear. As the delegates voted to nominate Frank Lowden of Illinois as vice president, the weary attendees, many suffering from the ailment of “convention feet,” made their way back to their hotels to pack and head home. Lowden declined the nomination, the only vice-presidential nominee to do so, and the delegates were herded back to the Public Auditorium for an emergency evening session. The trains were held at the station. 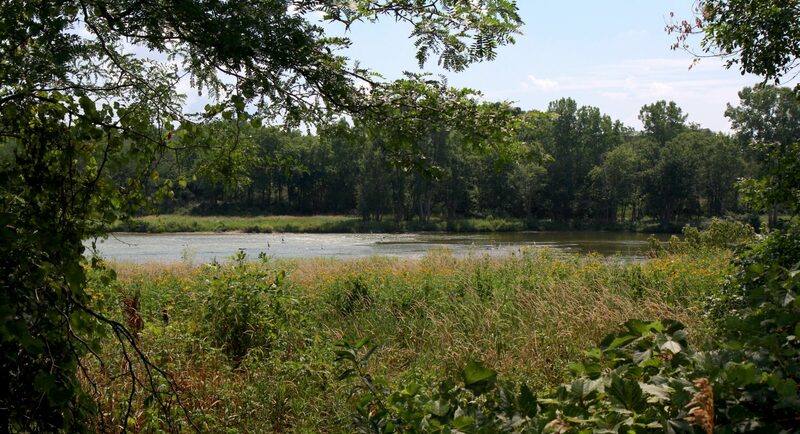 Just before midnight on June 12, the delegates, having nominated Charles G. Dawes as vice president, shuffled to their trains and sped off into the night. Reports after the convention praised Cleveland for its successes as a host city. The gleaming Public Auditorium was well-suited for the job. Accommodations, which organizers had worried might be too few, were actually in surplus during the convention. All went according to plan. 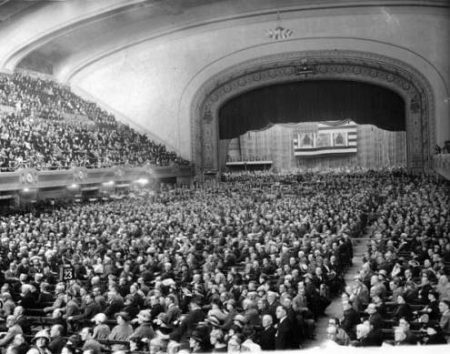 The Republican National Committee declared that “Cleveland is fast becoming one of the most popular convention cities in America.” And, in 1936, twelve years later, the Public Auditorium reopened its doors, and the RNC came to Cleveland again.